9/11 Experiment: Concrete evidence. Does it pulverize when falling? 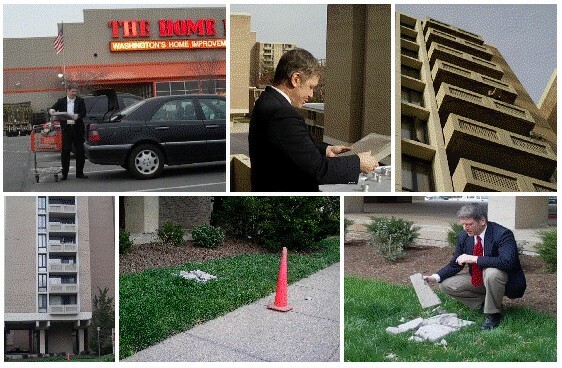 This experiment is to test the hypothesis that concrete pulverizes in to dust when it falls, as claimed by the official 9/11 Commission Report about the World Trade Centers. If concrete turns to dust so easily, the world needs to find a stronger, non-exploding building material. Blocks of concrete were purchased and dropped from a 5th floor balcony. It was found that the concrete cracked, but did not create a significant amount of concrete dust. Thus, this ground breaking study is a Myth Buster, as well as a concrete buster. Evidently, we need a new investigation commission, with scientists not just politicians, to find out what really happened on September 11, 2001. $2.3 Trillion in transactions cannot be accounted for. The Pentagon wing with the Accounting records was destroyed on 9/11. How convenient. So we will never know where the money went. How can we get a feel for how much $2.3 Trillion is? The Moon is an average of 384,403 km from Earth. that means you could stack 384 billion dollars to the Moon. A lot of murders have been done for much less money. If 9/11 was an inside job, it wasn't done for small change. Hani Hanjour, supposedly on Flight 77, was about 5 feet tall and the other hijackers ranged from 5.5 to 5' 7". They were of slim build. Captain Charles Burlingame of Flight 77 was over 6 feet, a Navy Captain, weight lifter, and a boxer. The OCT says pilots like him gave up their planes to these puny weaklings with box cutters? The story makes no sense. There are many ways the 6 foot men on the flights could have overcome them. 1. Take a seat cushion as a shield, and punch the hijackers out. 2. Pour hot tea or coffee in their face, then move in to disarm them. wrap their hand, then turn the box cutter on them. 7. Take a fire extinguisher, spray at the terrorists, then move in. This is a proposal for the Bill & Melinda Gates Foundation to support a New Investigation of the events of September 11, 2001. Bill has a scientific mind, and surely must see some suspicious things about what happened on that day. * WTC Building 7 came down at free fall speed, as if by pre-planted explosives. * WTC Buildings 1 and 2 also came down suspiciously fast, after have stood for nearly an hour. * The hole where the jet supposedly went in, is suspiciously small, with no wing marks. * Senator Max Cleland, said the 9/11 Commission was a "cover up" and quit it. Did you ever notice anything suspicious about Flight 11 and Flight 175? The paths and plane sites are right in plain sight. Millions have seen this animated graphic on USA Today. Click on "See All Flights", then "Go"
Why did Flight 11 from Boston turn Northwest instead of Southwest towards NYC? Why did Flight 11 "just happen" to cross paths "almost colliding" with Flight 175? Could terrorists have executed such perfect timing? Coincidence? Why would terrorists waste 1/2 hour on a detour, and risk being shot down? Why would they fly in the directon of Griffiss, Stewart, and McGuire Air Bases? He received his PhD in Physics from Brown University, worked for 33 years as a scientist at the Naval Research Laboratory, and has published 190 scientific research studies to date. He was also selected by NASA to study lunar rock samples. This is not to defend any type of terrorism. But it is a matter of perspective, who is a freedom fighter, and who is a terrorist. British Lt. Colonel T.E. "Lawrence of Arabia" used guerrilla (terrorist) tactics to drive the Ottoman Empire out of Arabia after World War I. He blew up trains on the Hejaz Railway and planted explosives (IEDs) to harass the Turks. These are terrorist techniques. In the west, Lawrence of Arabia is considered a hero, with a memorial at Oxford, books and a movie about him, winning 7 Academy Awards. Maybe this comparison of 2 men who sought independence for Arabia, will help us understand the perpective of those in the Arab world who feel Osama is a hero. We need to try peaceful methods and understanding that every man wants to defend his home land. Why would Al-Queda call themselves "The Database" in 1988? >Al Qaeda is a name that this group choose for themselves. No, buddy. That is not true. when he learned that this was what the Americans were calling him and his followers. Will those who benefit financially, and for job security, use the term "Al Queda"? Absolutely. "Oh yes", they'll say. "And they have high tech undeground bunkers in the caves of Afghanistan!" Will the Northern Alliance accept money to help you find these complexes in the hills? Absolutely. Have we ever actually found more than just some natural caves? First, let's do a simple experiment to find out what Al Queda actually means. 1. Go to the Google Translator to translate from English to Arabic. 3. You will see it literally means "al Qāʻ-dh"
Farsi is similar, but displays their strange alphabetic characters, which read right to left. You'll recognize this symbol on American made documentation about Al Queda. Apathy Time - how long until the public forgets and does not care? It is common knowledge now that the Gulf of Tonkin incident was a false flag operation to get the USA in to war with North Vietnam. Robert McNamara has come out publicly to acknowledge that the incident never happened. Over 30000 troops died in the Vietnam War. But where are the protesters now? Who is calling for a new investigation? Why isn't McNamara being charged for participating in a conspiracy that caused so many deaths? The public does not care. There is evidence that The Maine was a false flag op to get us in to war with Spain. But there are no calls for a new investigation now. It has been so long. No one cares any more. We are not giving Puerto Rico back to Spain. So there seems to be a time period, about 20 or 30 years, when the new generation hears about incidents in a history book or web site, and is apathethic about false flag operations. They may be interesting, but not motivating, to the public. It has been almost 10 years since 9/11/2001, and it is harder to get people to care about what happened. It has been almost 7 since the start of a war to find weapons of mass destruction that did not exist. Where are the protesters now? If anyone can help get a new investigation going, it is the insurance company that was forced to pay billions to Larry Silverstein. The indications of insurance fraud include Larry's bidding to become the landlord of the asbestos filled World Trade Center buildings only weeks before 9/11, and taking out the maximum possible insurance against terrorist attacks. He, his son, and daughter "just happened" to be late (by over an hour) to their usual 8:00 am meeting at the restaurant atop World Trade Center 1 on 9/11/2001. Larry is a billionaire who could hire a team of doctors to meet at his convenience, even at midnight. Yet he claimed to be missing the 8:00 meeting with his tenants to go to a dermatologist, an appointment he did not attend. On PBS television, Larry falsely claimed to have spoken with "the fire department commander" who said the smartest thing for WTC 7 was to "pull it" - a term for controlled demolition. Here is the information to encourage Swiss Reinsurance to re-investigate 9/11. 9/11 Experiment: Does Concrete Pulversize into Dust when it Falls? 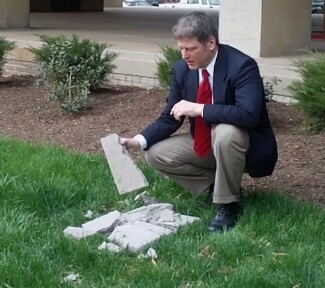 Abstract: Concrete cracked in to chunks but did not turn to dust, when dropped 50 feet. Methodology: Blocks of concrete were purchased. One block was dropped from a 5th floor balcony on to another block. The experiment was video recorded. Result: It was found that the concrete cracked in to chunks, but did not create a significant amount of concrete dust. Conclusion: Another explanation for the pulverized dust needs to be formally investigated, such as the presence of pre-planted explosives in the World Trade Centers. It was also found that terrorists would not be able to purchase nano-thermite easily. Project for a New American Century's "office" in DC is just a mail drop. Project for a New American Century lists their office address as 1150 17th Street, Suite 510, Washington DC on their web site front page. http://NewAmericanCentury.Org But, like their misleading advice as a "think tank" this a phony "mail drop" address. PNAC presented a report called "Rebuilding America's Defenses" written mostly by Chicken Hawks who never joined the military. It said that "it will take a catastrophic and catalyzing event, like a new Pearl Harbor" to get the American public's support for using our military might. Like their "military leadership" the PNAC was about false appearances instead of truth. The PNAC, hiding behind a phony office "front", with a misleading web site, helped get America in to a war over false pretenses.